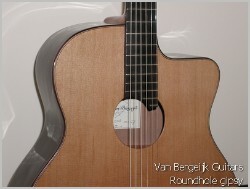 Round hole gipsy guitars are always on request. Some players love the sound of the gipsy guitar but prefer a more regular sound-hole. Selmer made some very good sounding round-hole instruments. The are some more differences than just the sound-hole. Possible to make a 12 fret neck body joint. The bridge is more located in the middle of the soundboard (the top) in that case. I prefer a location in the middle of the soundboard. Just as by the classical guitar. 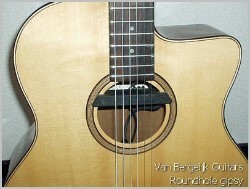 In some cases the customer prefers a very simple sound-hole without any inlay. 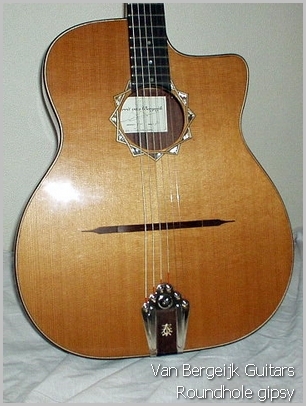 Other parts of the guitars are constructed the same as the Vienna: Stiff back and stiff neck. Some players love this guitar for finger-style bossa nova. 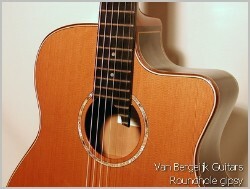 Contact me for information about Round-hole Gipsy guitars.